Army Maj. Daniel Gade doesn’t think a wheelchair is the right piece of equipment for him. “I should be able to choose a reasonable piece of equipment,” said Gade, who lost his right leg at the hip after he was wounded in Iraq in 2005. For him, that’s a Segway — a two-wheeled, gyroscopically stabilized, battery-powered personal transportation device. “Disabled veterans and others with mobility issues should be accommodated in all circumstances, whether they use a Segway or a wheelchair,” Gade said. With his prosthetic leg, day to day, he walks like anyone else. “But a three-block walk is a long walk for me,” he said. 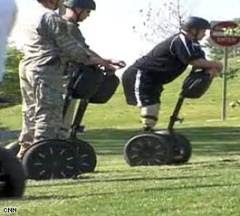 The Segway allows him to stand while gliding to his destination, easily controlling the speed. It’s also healthier to stand at least part of the time, instead of sitting all the time, to improve balance, circulation and digestion. As part of a raft of proposed changes to meet the guidelines of the 2004 update of the Americans With Disabilities Act, the Justice Department is considering addressing the use of Segways in public places. The proposed changes were published in the June 17 Federal Register. “If people feel this is important, they need to comment,” Gade said. Comments can be submitted at http://www.regulations.gov. The deadline is Aug. 18. “The Segway, for the first time, allows someone with a disability to get around standing up,” said Jerry Kerr, president of Disability Rights Advocates for Technology. In DRAFT’s Segs4Vets program, 157 Segways have been donated to wounded veterans of Iraq and Afghanistan, and the group hopes to give another 135 this year. Kerr contends that the Segway should be classified identically to the wheelchair, noting that it is specifically designed for indoor and outdoor environments. The footprint of the Segway is smaller than a wheelchair, and it weighs less than power wheelchairs and most scooters. This could pose a problem, Kerr said, because it will separate them from a category of “medical devices,” such as wheelchairs and scooters, which must be accommodated. The proposed guidance “threatens to deal a severe setback to America’s disabled community and senior citizens,” by discriminating against Segways and other technology devices that improve the quality of their lives, Kerr said.